Show 64, March 8, 2014: Garrett Marrero, founder, Maui Brewing Co.
Don’t let the gastropub moniker food you. The food at the casual Haven Gastropub is seriously good! They also do an exemplary job matching unusual craft beers with the menu items. Across the street from the original Old Towne Orange Haven is The Bruery Provisions, a gourmet foods specialty store run by The Bruery craft brewery. They are racing to keep up with demand for their line of craft beers and simply don’t have the time anymore to run the gourmet specialty food store. Enter Haven Gastropub. 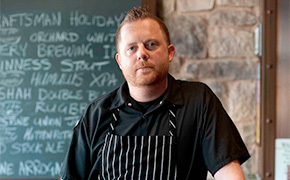 Chef Greg Daniels will now supervise and enhance the culinary aspect of the repositioned, Provisions. There will be more freshly prepared grab-and-go food items in addition to the incredible selections of beers. Boutique cheeses and charcuterie, too. Look for the relaunch in early April under the direction of the Haven Gastropub team.